Reduce your electricity bill demand charges. Did you know that nearly all power distributors now penalize businesses that have a poor power factor? This is indicated by a charge in kVA in the network section of your electricity bill. The header image above is an example. The technical description of power factor is complex. Explaining in simple terms; when electricity is used by equipment (i.e. motors or lights), the equipment itself impacts the electricity. A portion of the electricity is distorted and becomes useless (this is called Reactive Power). This is particularly so from older, less efficient equipment. Because some of the electricity is now distorted, more electricity needs to be delivered to the equipment for it to run. Therefore, the total amount of electricity delivered to a site includes both the useful electricity (the Real Power) that enables equipment to work, and the electricity that is distorted and useless (the Reactive Power). Electricity retailers charge for the creation of this distorted electricity via the kVA demand charge. kVA (known as Apparent Power) includes a measure of power factor in its calculation. Power factor is measured on a scale between zero and one, with 1.0 representing optimal efficiency. The penalties for poor power factor can be high and add a significant cost to your monthly bill. 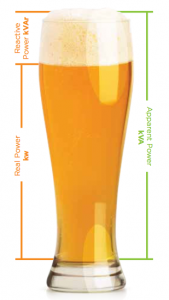 In the image of the glass of beer below, the froth represents the useless reactive power. Though only the liquid in the glass is of value to you, you must pay for the whole glass of beer including the froth. 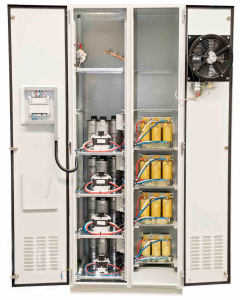 Power factor correction equipment reduces the kVA demand charge on your electricity bill. The equipment uses capacitors to remove the distorted power. Relating to the image above, the froth is removed and you only pay for the liquid. In electrical terms, when the Reactive Power is removed, the Apparent Power (kVA on your electricity bill) then equals the Real Power. Thus you are no longer paying a financial penalty for the reactive power. The design of PFC equipment is important for its longevity. For instance, the harmonic blocking reactors (which are necessary to filter out harmful harmonics which otherwise damage the capacitors) can generate a lot of heat. High-quality properly engineered PFC units have these reactors physically segregated from other sensitive components. This prevents the heat generated from causing damage and reducing the lifespan of the equipment. Many cheaper units do not physically segregate the reactors from other components. While this enables a lower initial cost, it can result in major additional costs and safety issues in the long run.